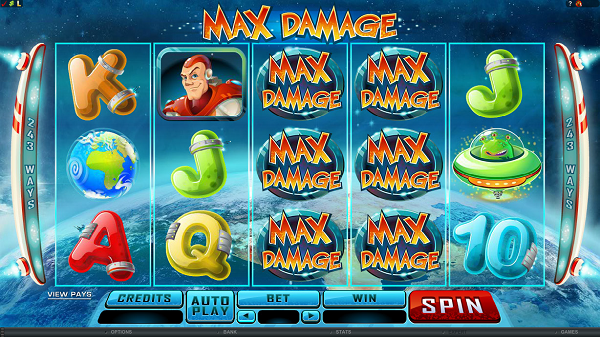 Max Damage online slot from Microgaming provides you with an out-of-this-world experience. What Microgaming has done with this game is to reproduce the look and feel of a classic space arcade game from the 1980’s when they first came out, but of course giving it the modern elements and feel that their latest games all have now. The theme of Max Damage is based around an Alien attack, and Max is the super hero who has to save the earth from Alien invasion. You will see a lot of different space ships and planet symbols landing on your reels, which all have different purposes in the game. The game is a 5 x 3 reel video slot game, and has 243 different ways of winning. So you can get a better idea of what Max Damage has to offer, here are some of the game specifications. There are several different bonus rounds that can be activated while playing Max Damage. Your main aim is to get as many Free Spins as you can, and these are activated when you get the Scatter symbols appear on the reels. If you get 3, 4 or 5 of these landing on your reels then you will activate 15 Free Spins. As you go through your Free Spins, every winning combination you hit (except for the Alien spaceship coin prizes) will be doubled. Also, you may well see an Alien spaceship land on the reels as you go through your Free Spins, and when they do Max will then blast them and you will then be issued with a coin prize within a certain win range. Once the spaceships have been blasted away by Max, they will then be turned into Wild symbols, which in turn will give you the chance of hitting more winning combinations. The coin sizes available for Max Damage are 0.01, 0.02 and 0.05. The minimum bet is 0.30, with a maximum bet of 15.00, so there is quite a big range for players of different levels to play with. The graphics and audio on the game are both of excellent quality. 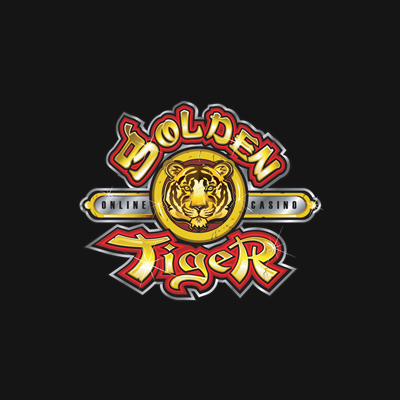 Everything bursts into life when you hit the bonus Free Spins and you can expect to see a lot of lively graphics appear on the screen when this starts. The game is suitable for players of all ranges, although it will really appeal to the beginner or those that just prefer to play smaller bets and enjoy playing for as long as possible. 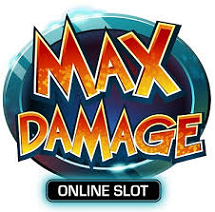 Max Damage slot is a lot of fun to play, and has quickly become a favourite with a lot of online slot players. Start playing now at Casino Rewards online casinos.